The halls are decked for the holidays! You are cordially invited to visit Farnam Manor to experience the beauty of the season! You never know what treasure you may find at Farnam's holiday sale! Did you ever wonder what was in the closets of Farnam Manor? 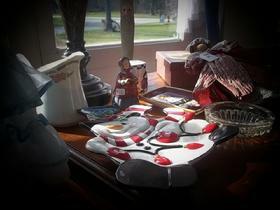 Well, we found antiques, books, Fenton Glass, dolls and much more! And it is all for sale! Forget the madness of the mall ! Relax! Enjoy the Yule Tide music. St. Nick will be here Sat. and Sunday afternoons with free toys for the kiddies! Put your holiday shopping dollars to good use this year by purchasing unique gifts while helping to preserve the historic Farnam Manor!